The head honchos at Google are notoriously tight-lipped about the intricacies of their PageRank algorithms, which have evolved significantly over the past decade. But last year the company announced that RankBrain, an artificial intelligence system that monitors search results, was the third most important factor in Google's ranking algorithm. That left the top two factors up for debate. Later, Google Senior Search Quality Strategist Andrey Lipattsev shed light on that during a truly enlightening Q & A with several web marketing experts (embedded above). Lipattssev noted that content and backlinks were the top two ranking factors. While most of us grasp the concept of delivering relevant, keyword rich long-form content, earning backlinks can still be tricky business. Check out these three link building lessons based on work we've done with the Health and Wellness Alliance for Children, a collective impact organization dedicated to improving the health and well-being of children in the Dallas area. 1. Riff on the guest blog. The conventional guest blogging strategy for earning backlinks is to write guest blogs for others, judiciously including links back to your own website in the body of the article and your author bio. This straightforward approach certainly works for garnering inbound links. But what if you could spend the same amount of time crafting amazing content, and let it live on your own website, where you'd reap other SEO benefits as well? Consider writing content for your own website that features partner organizations or key industry leaders. This content works because it confers credibility; your partners get the benefit of letting someone else talk about their successes, and they can simply link back to your article without any additional effort. With so many incredible partner organizations, the Alliance perfectly lends itself to this approach. For National School Breakfast Week, for instance, we featured two major partners who fight food insecurity through school breakfast programs: Dallas Independent School District and Children at Risk. Promoted via social media and the Alliance's newsletter, the articles garnered plenty of traffic on their own. 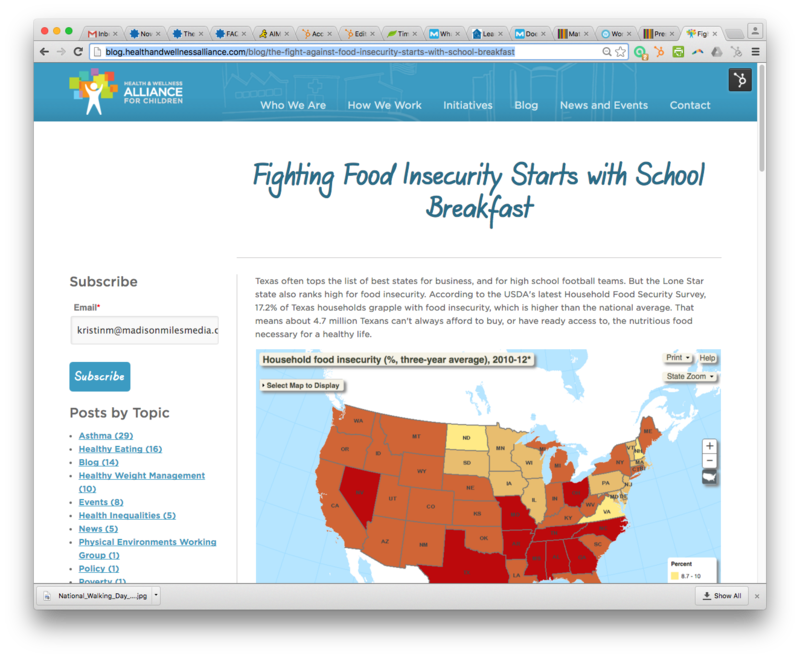 They also provided a great opportunity for two partner organizations to link back to the Alliance's website. Align your article with your partner's goals and needs. Connect with your partner organization's marketing lead to find out what they'd like to showcase, and build that into your article. 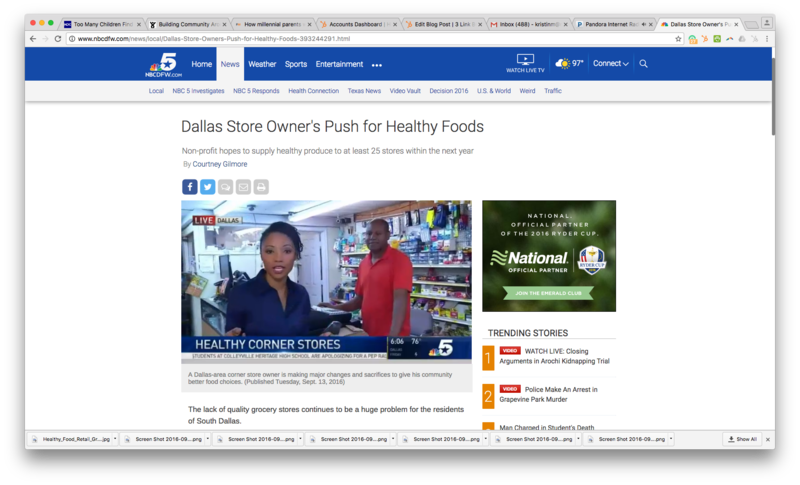 For instance, Dallas ISD wanted to showcase a new smoothie program they'd recently launched and planned to phase in county-wide. Share the link with your partner organization first. Invite your partners into the review process, and provide them the link before the final post goes live. That will reinforce your desire to cooperate and reiterate that you truly respect the value they bring to your partnership. 2. Provide online marketing collateral to partner organizations. As part of your content marketing strategy, you're already building landing pages and other marketing collateral for all of your company's key initiatives and product lines. If you collaborate with other companies or organizations on these initiatives, you're poised to help them market those initiatives while ensuring that their marketing efforts are aligned with best practices for link building and other facets of SEO. Remember, not every organization has the same marketing budget and bandwidth as you might have, so this additional resource can prove invaluable. With that in mind, leverage the content you're already creating for yourself and create a parallel version to offer your partner organization. For example, if you're already writing copy for a landing page about a particular project, draft similar copy for your partner. You can also co-brand any related case studies or white papers, to give your partner organizations added incentive to link back to them. Note that any copy you provide to your partner organization should be original, to avoid getting penalized for duplicate content. The Alliance recently partnered with the National Center for Healthy Housing (NCHH) for the 1000 Communities Campaign. 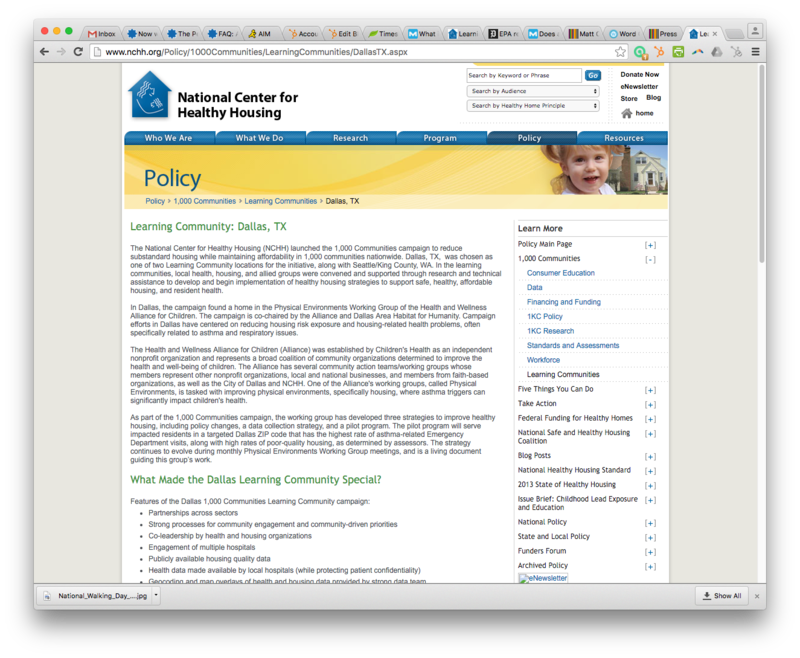 We provided landing page copy to the NCHH to post on its website, along with online documents for each strategy associated with the campaign. This resulted in multiple backlinks from a highly reputable domain. Position your copy as a blueprint or draft. Let your partners know that they can truly own any copy you generate for their website; they're free to change it as they see fit. You may want to specifically request, however, that they leave one backlink to your organization. Make your partner organization shine. Consider that this copy will live on their website, not yours. Highlight their role in the initiative, without writing your own organization out of the story completely. Reciprocate the backlink. If your partner organization publishes the copy you provide with a baclink to your site, incorporate a backlink for them on your corresponding web page. Share the backlink love! 3. Put press releases to work (the right way). Do you remember the days when companies would pump out dozens of SEO-optimized press releases through syndication sites, chock full of backlinks to their own domains? That strategy (rightfully) got a bad rap, and press release syndication has fallen by the wayside. But press releases still have a place in your backlink strategy. The tricks are to limit your press releases to topics that are truly press-worthy, and to write for humans rather than search engines. First and foremost, you should absolutely publish your company's news somewhere on your own website. Then think about the best ways to distribute a different version of that content elsewhere on the web. You may decide to contact journalists directly and send them a link to the press release on your website, or you may opt to go the more traditional distribution route. Either way, if your news is truly newsworthy, it will likely generate interest. A prime example was the Alliance's recent recognition by the the Environmental Protection Agency (EPA) Region 6 for their efforts to improve housing conditions for children with asthma. Following the award ceremony, the Alliance's parent organization, Children's Health, published a press release about the achievement. 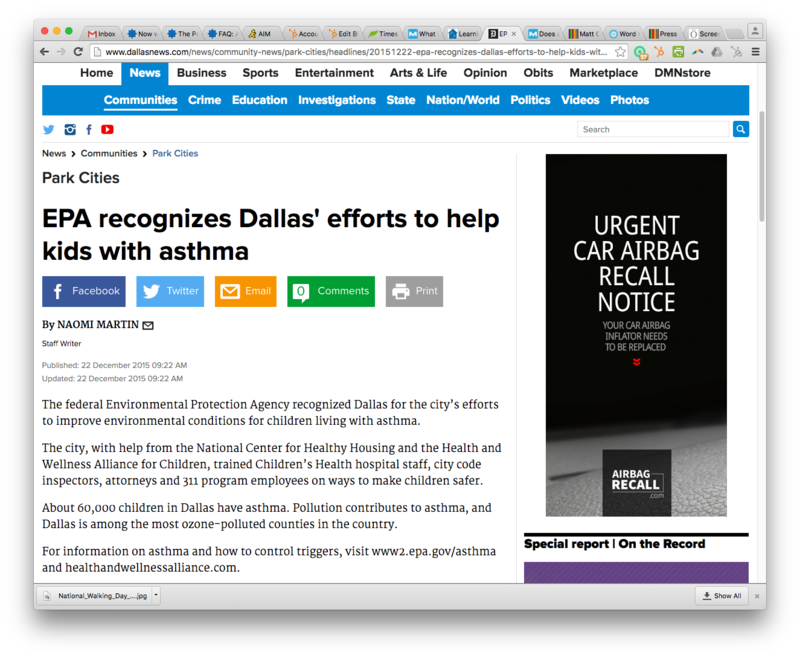 It was picked up by several news sites, including Lung Disease News and the Dallas Morning News, earning multiple backlinks. Write for journalists, not for Google. Journalists look for very specific information when they skim press releases. They don't want links back to your product pages, but they do want links to the profile pages of experts you cite, for instance. As you write each press release, think about how you can make their job easier by providing as many useful facts as possible. Pair press releases with proactive outreach. Journalists receive countless pitches each day. As part of your social media strategy, identify key journalists in your industry and keep their contact information handy. When you publish new press releases, send them the link along with a very brief teaser. You can even do this via Twitter if necessary. 4. Include the right keywords. This seems like an incredibly simple recommendation. After all, we all spend plenty of time implementing a keyword strategy for our websites and can probably recite the long-tail keywords that drive the most traffic to our websites. Okay, maybe I'm a little too into keywords, but they're certainly the foundation of any robust online marketing strategy. But earning high-quality backlinks sometimes requires a slightly different approach to keyword selection. The first step is to follow industry news and related current events, so you'll know about hot topics and how they fit with your own company's objectives. You'll find that some keywords you might not necessary target with your overall SEO strategy might be perfect for a shorter-term campaign. Once you've identified these keywords, find meaningful ways to contribute to the conversation. Avoid shameless newsjacking. Stick with news stories and trends that truly fit with your company's mission and offerings. Your best bet is to focus on niche stories that appeal to your target audience, rather than sensational stories that relate only tangentially to your company or require you to force an inauthentic connection. Focus on creating value. Think about what you can add to the conversation. 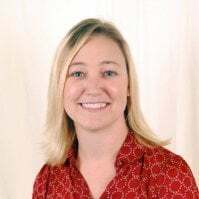 The Alliance's blog post about the connection between public policy and food access, for instance, offered a historical perspective on a very current problem. It's no wonder that article has been the top-performing post every week since it was published — it delivers something deeper than most other related content.